We started with breakfast at Mara again (I really liked their fruit plate - it had slices of honeydew melon, cantaloupe, pineapple, grapes and papaya! 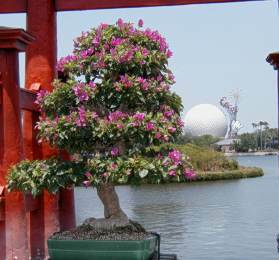 ), then drove over to Epcot. We saw the new "100 Years of Magic" topiaries in the entrance plaza, as well as the new Steamboat Willie topiary, then bypassed the already long line for Spaceship Earth (silly people don't realize that it will be a walk-on later in the day) and went into Innoventions to send some internet postcards. We wandered through Innoventions East and West, though the only thing that really seemed new was the "Segway" two-wheeled scooter thing. Though it would have been much MORE interesting if they'd allowed US to try it out. 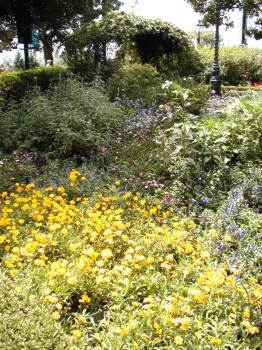 So then we started looking at the Flower and Garden displays - after all, that's one of the reasons that we come at this time of year! 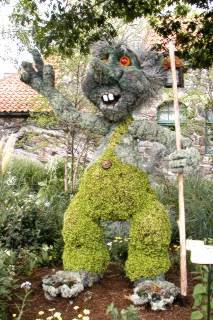 Small rant regarding this year's Flower and Garden...there were obvious cutbacks this year. 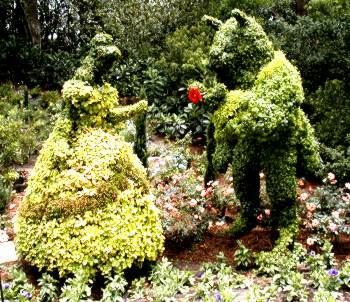 Many of the topiaries that they have used in the various World Showcase countries were missing - like Aladdin and Jasmine in Morocco, and Pinocchio and Geppetto in Italy. 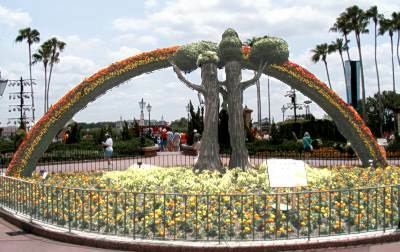 Other things we missed were the "orange trees" that decorate the French Arm (the terraced waterfront area in front of France), the iris tapestry and musical water garden in Japan, the "surprise" water-spray container gardens in Italy, and the topiary dragon in China. Several of the countries (France, Germany, Italy) didn't seem to have anything that was special for the Festival at all - just the sorts of landscaping displays I would usually expect. There were a *few* new things...but I'll get to those as we come to them. 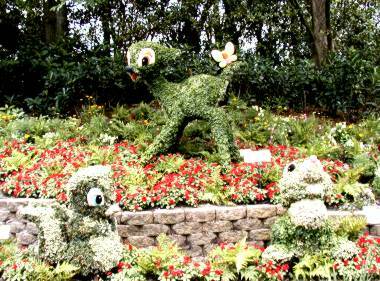 :-) Overall, though, I'd have to say that the Flower and Garden Festival was rather disappointing this year. 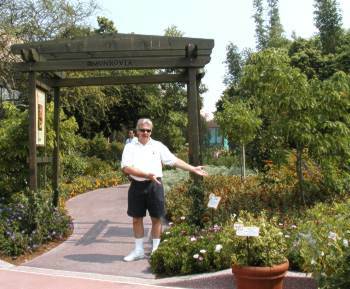 There were some nice garden areas in Future World East, including one Lee really liked that was very meadowy. The "Big Bugs" they've had the last few years were missing, though. One nice thing they've done this year is moved the Festival Center, where most of the vendors and gardener talks take place, indoors into the area next to the Fountainview Cafe. They had some of these in an air-conditioned tent in past years, but many of the vendors were in small non-air-conditioned tents. I'm sure they were much more comfortable this year! 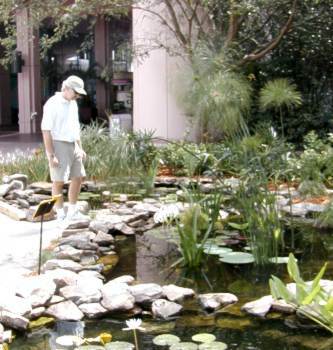 There wasn't a lot to see in Future World West, though there was a nice set of ponds with various water plants and fish in them. Also some pollywogs - not sure if those were intentional or volunteers. :-) Lee likes ponds and running water, so he was especially interested in these. The roses along the "Rose Walk" were not blooming quite as vigorously as I've seen in previous years, though they were still pretty. 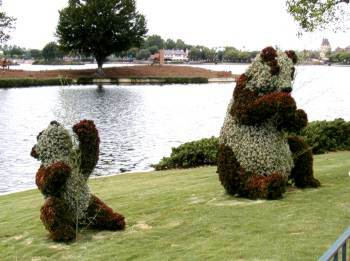 In World Showcase plaza there were some new topiaries - the last few years it's been Sorceror Mickey and Fantasia themed, but this year the main exhibit is a couple of Ent-ish looking trees from "Flowers and Trees". 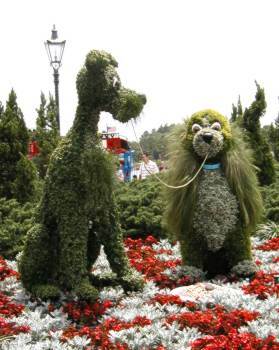 There was also a really well-done Lady and the Tramp topiary. 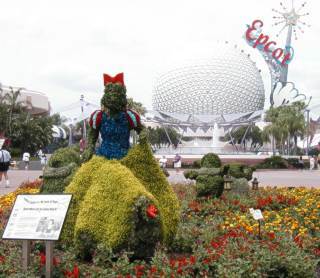 The Snow White and the Seven Dwarfs topiary was relocated from Germany to the Fountain Stage area. 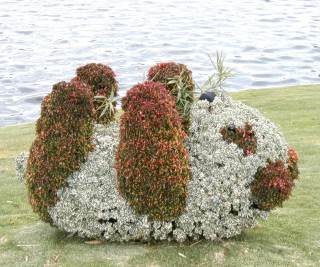 Norway had the troll topiary they had last year...In China they added another couple of panda bears to the one they had last year. 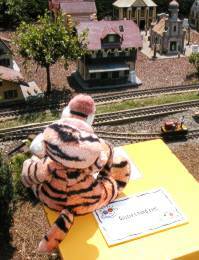 The miniature railway next to Germany was very festively decorated with its own version of the Flower and Garden Festival. As they had last year, there were several buttons you could push that would do things like operate a handcar, make the ferris wheel spin, or turn the maypole. 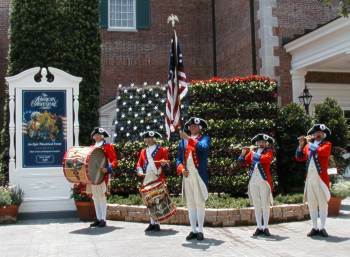 Outside the American Adventure were two American flag topiaries - one of the 1776 flag, and one of the current flag. 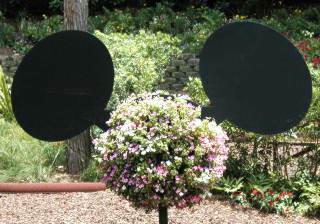 There were also some large star topiaries and a patriotic Mickey and Minnie in the fountain. Japan had their usual bonsai collection on exhibit, and as I've already mentioned the "Iris wall" and "Musical Garden" were missing. 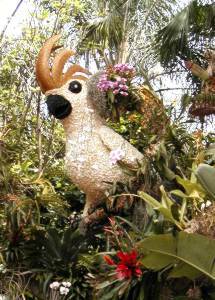 The best new exhibit was in Canada - a huge peacock topiary with an entire garden for his fan. It was really colorful and very well done. Oh, while wandering through the UK we did try something new - we'd never had the Fish and Chips before, so we got some as a snack. They were pretty good...the malt vinegar definitely added to the flavor. Despite the length of this account, this was just about our shortest day in the parks. :-) It was another warm day and I was ready for some pool time. Lee still wanted some more park time, though, so he dropped me off at the Lodge and then he went back to Animal Kingdom to commune with the tigers. Our dinner that night was at Boma, the buffet restaurant at Animal Kingdom Lodge. We've eaten dinner there before and were happy to be going back. The cuisine is not necessarily authentic African, but at least inspired by ingredients available there. They have a large selection of soups, salads, meats, and vegetarian dishes - and a terrific dessert bar! We sampled a little of a number of different dishes, but still left room for dessert. :-) We both had the Zebra Domes for dessert - these are striped hemispheres of kahlua and chocolate mousse. Really delicious! I also had a chocolate mousse/truffle thing which had a wonderful chocolate hazelnut crust on the bottom. I think Lee also had a fruit tart or something like that. They also had bread pudding, brownies, cheesecake, and another type of jam tart. We decided to "drop in" to the Tower of Terror first - no wait, and we walked straight into the library, and then almost straight into an elevator! The Bellhop/Cast Member was obviously enjoying her job immensely - I don't remember any of her comments, but they were fun. I went in and found seats for Hunchback while Lee went in search of...food, and brought back a sweet pretzel from a place on New York street. Once the pre-show started, we got to see our juggler, Matt, do his newest routine with the broomsticks (in honor of Fantasia and Sorcerer Mickey). It's a lot of fun. Hunchback had a new (to us) Frollo, but I think the rest of the cast was the same as the one we saw in December. One thing I noticed is that they are no longer dropping confetti on the audience - I kind of miss that. But of course it means less clean-up for them. We went to the Animation Tour then - we'd just missed a tour, so had about a 15 minute wait. But it was in the shade, so that wasn't too bad, and of course the tour itself is all indoors! The new movie that will be coming out is called "Lilo and Stitch", about a little Hawaiian girl (Lilo) and the dangerous alien she adopts thinking it's a dog (Stitch). (One wonders about a child who thinks that something that looks like that is a dog, but oh well.) I don't know...I can't say that what I've seen of the movie so far really excites me...guess we'll see after it comes out. We got FastPasses for "Who Wants to Be a Millionaire" which I had never seen, and which Lee was not too enthused about, but willing to humor me. 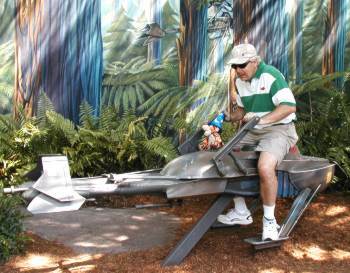 After that Lee decided to take me on this *extended* walk around the Studios...it was HOT and I was tired and really not happy about wandering around in the heat. Fortunately by then it was time for Millionaire, which was air-conditioned!!! For those who don't know..."Who Wants to Be a Millionaire" at Walt Disney World is set up in a studio that looks VERY much like that of the TV show, but the contestants play for *points* and not money. At each point level you get various prizes - like a hat, pin set, polo shirt, etc. Anyone who gets to the 1,000,000 level gets a trip to New York to see a TAPING of the real show. Regis appears in the pre-show, but the real emcee is someone else - the guy we had was pretty good. When the first guy lost out (on the 16,000 point question) Lee was #3 on the leader board! That was pretty cool. That was our closest brush with fame, though - there were two more contestants after that, but neither of us made the top ten. The show was a lot of fun, and Lee enjoyed it much more than he thought he would. 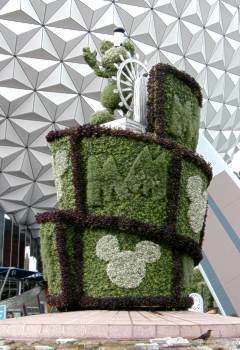 Even though it was now after 3:00, and we could have gone to check in at the Boardwalk, since I was refreshed by my time in "Millionaire's" air-conditioning, we went into "One Man's Dream" which was also nice and cool! It was around 4:00 by then, but I wasn't interested in staying another hour to see the 5:00 parade, so we headed back to the car and drove to Boardwalk. We didn't get the Boardwalk view I had requested - but at least we had a view of the "quiet pool" and NOT of the malevolent Swans, and our non-smoking room did NOT reek of smoke this time! We WERE just about as far from the elevator as you could get, though. 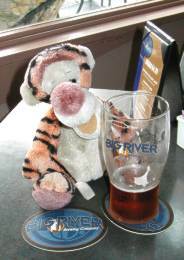 We hadn't had lunch so we went down to Big River Grille and Brewing Works for an early dinner. *Inside*! It was only about 5:00, and there were a LOT more waiters hanging around than there were customers - we felt outnumbered! :-) We split the Grilled Chicken Cashew Salad and the Blackened Mahi Mahi sandwich. Both were good, but I especially liked the salad. I had lots of water to drink! I've always like the food there - nothing fancy, but good, and the portions are pretty large. After dinner I was feeling human again, so we went into Epcot. We had just enough time to get to the American Adventure and see the Voices of Liberty's final show of the day. By then it was time for the Tapestry of Dreams, so we watched that go by in front of the American Adventure. Lee thinks the little girl pixies are cute and that two of them look like twins...I think the "Leonardo Columbus" DreamSeeker looks like an overgrown Oompa Loompa. It was a little bit windy that day, so some of the puppets (the little Sprites, "Angel Girl" and "Bird Man") didn't appear. 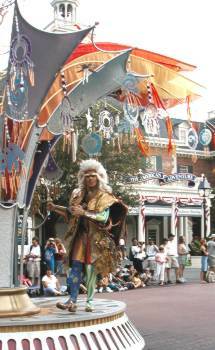 I still like the music, but I miss the "Sage of Time" and the way he used to stalk down the parade route. The best part of the parade is always watching the puppeteers interact with the guests - you see lots of smiles from both sides. We took the long way back to the Boardwalk, via Yacht and Beach Clubs, and stopped at the Boardwalk's store to get some chocolate ice cream and milk, figuring that since we had a full kitchen we must have a blender so we could make our own milkshakes. Well, no blender, but we managed to mix up the milk and ice cream into something yummy. Text and photographs copyright © 2002 by Laura Gilbreath. All rights reserved.